At the height of Prohibition, Al Capone loomed large as Public Enemy Number One: his multimillion-dollar Chicago Outfit dominated organized crime, and law enforcement was powerless to stop him. But then came the fall: a legal noose tightened by the FBI, a conviction on tax evasion, a stint in Alcatraz. After his release, he returned to his family in Miami a much diminished man, living quietly until the ravages of his neurosyphilis took their final toll. Our shared fascination with Capone endures in countless novels and movies, but the man behind the legend has remained a mystery. 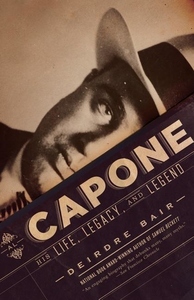 Now, through rigorous research and exclusive access to Capone's family, National Book Award-winning biographer Deirdre Bair cuts through the mythology, uncovering a complex character who was flawed and cruel but also capable of nobility. At once intimate and iconoclastic, Al Capone gives us the definitive account of a quintessentially American figure.